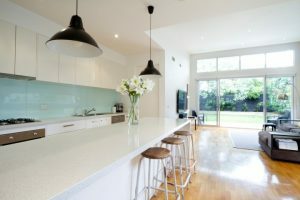 Geraldton Glass & Security Doors can supply and install stylish glass splashbacks in your kitchen, bathroom or office. Glass Splashbacks can make a great impression and will add a modern look to your home or office. They are an ideal solution for styling kitchens, shower walls, vanities, bath surroundings and administration areas in offices. We can help to give your home or office modern finish with a touch of style and sophistication. The materials that our splashbacks are made from come in a wide selection of colours and designs. Glass splashbacks are also very easy to clean and maintain. Glass splashbacks are very versatile and can be used in virtually any room in your home or office, from kitchens and countertops to shower walls, vanities and bath area surroundings.